Order Project CRISS support products by submitting this order form by fax or email, or give us a call. When Project CRISS is done well, it is the reform initiative for integrating the Common Core into a school system. 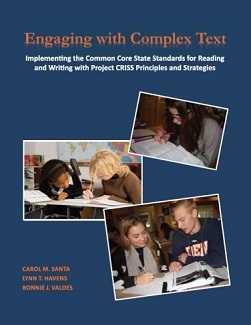 This book shows how Project CRISS implementation is the practical means to achieve the goals and expectations specified in the College and Career Readiness Anchor Standards and the English Language Arts Common Core State Standards. How the CRISS Frameworks for Teaching and Learning guide students to become independent readers and learners with all types of written materials. Tools to identify and work with author’s craft and perspective. Reading and writing strategies to engage students with complex text. Strategies to determine central ideas. Teacher- and student-developed questions to focus, challenge, and engage students with text. Organizing formats to delineate and evaluate arguments. Steps for each strategy to introduce, model, and guide students to successful implementation. Reflection prompts to help students be metacognitive about their own learning and how their learning processes directly link to the standards for reading and writing. This practical resource will help secondary educators across the curriculum who expect students to read and write content - whether they are experienced CRISS implementers or first year teachers. (Empower Lifelong Learning, Inc., 2014) 8½ " x 11", 101 pages. Project CRISS offers Common Core implementation support workshops.